Burlap is on fire with trendsetting decorators for everything from window coverings to wedding favors. Homey and warm, burlap conjures images of the simple life and country living. Its earthy colors and coarse weave make burlap the perfect backdrop for embroidery laced with buttons and beads. 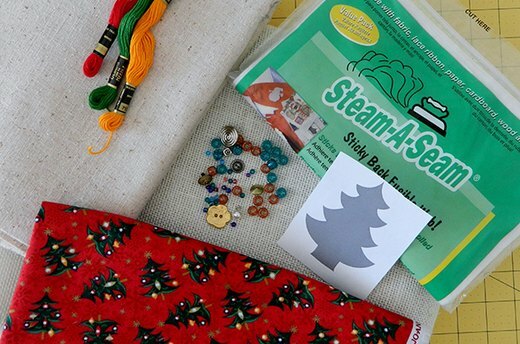 So grab your embroidery thread and take a dive into your button box to create a stocking that will transport you back over the river and through the woods to Grandmother’s house for the holidays. You’ll need a yard of bleached or natural burlap (the tighter the weave, the easier it is to work with), a yard of muslin for the lining, 1/3-yard of contrasting fabric for the cuff, fusible web or lightweight fusible interfacing, a template of the image you’d like to embroider, embroidery thread, and buttons, beads or other trims. You’ll also need a sewing machine and your iron and ironing board. To make your pattern, download a template and use your photocopier to enlarge it to the desired size. 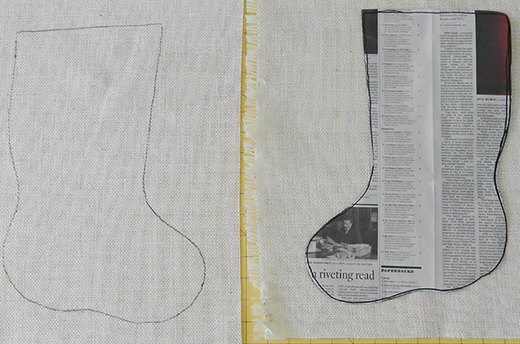 Or, you can trace around another stocking on newspaper, leaving about an inch all the way around for seam allowances. Burlap is tricky to work with and getting your pattern straight on the weave can be a challenge. 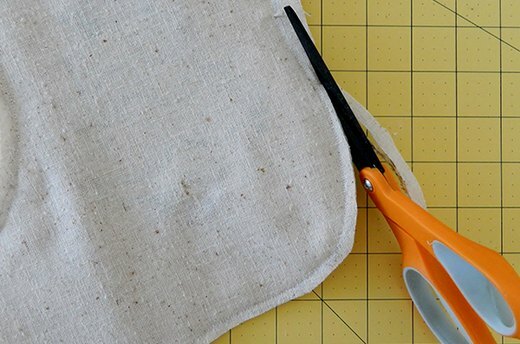 Iron the burlap to remove all wrinkles and folds. 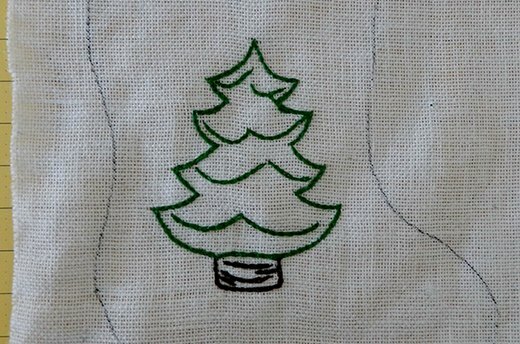 Following single thread lines in the weave, cut two rectangles of burlap larger than your stocking, cutting one at a time. 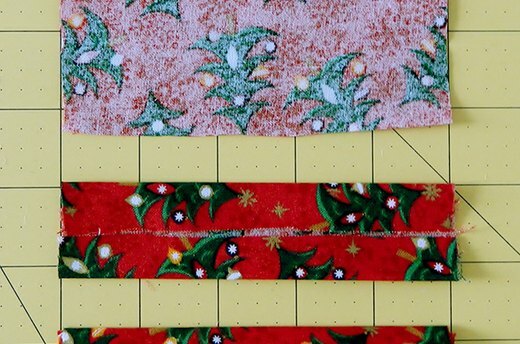 Using a permanent marker, trace the stocking onto each rectangle, keeping the top and sides of the pattern straight along the weave lines. Turn the pattern over to trace the second piece. Do not cut out the pattern yet. 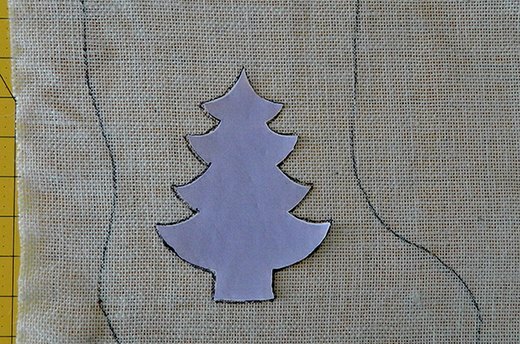 Remove the paper backing from the fusible web and apply it to the back of one of the burlap rectangles, making sure it covers the width and length of the stocking pattern. Since most fusible web is sold in smaller sheets, use more than one piece if needed to cover the whole pattern. Press the web firmly with your hands so it sticks to the burlap. 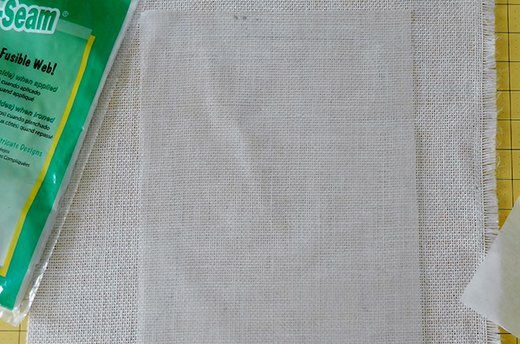 If you’re using fusible interfacing, you can iron the burlap rectangle now to fuse the interfacing. Download, size and print a template of your favorite design. 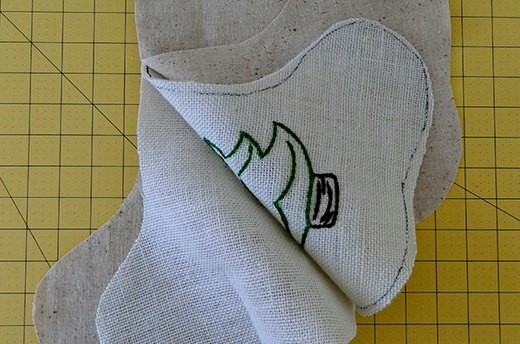 Cut out the template and trace the image onto the front of burlap stocking with the fusible web backing. Use all six strands of embroidery thread and your favorite stitches to give your picture depth against the coarse fabric. Burlap's symmetrical weave makes it a perfect canvas for fans of cross-stitching. 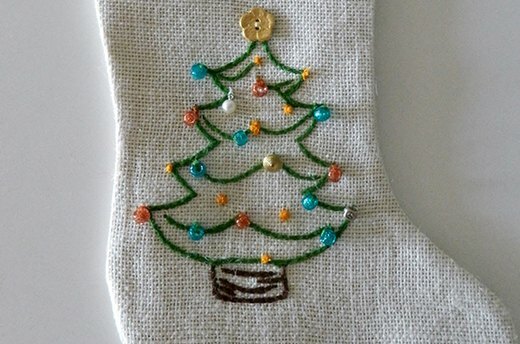 Stay-stitch around the stocking 1/4-inch inside the traced outlines to keep burlap from fraying, then cut out the burlap stockings. Cut two stockings from the muslin. 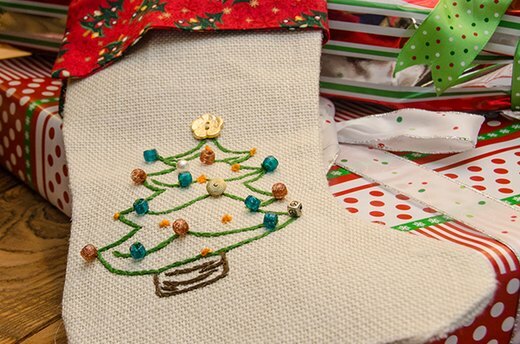 Layer your stocking pieces together in a “sandwich”: muslin, burlap without embroidery, burlap with embroidery (right side towards other burlap piece) and muslin. 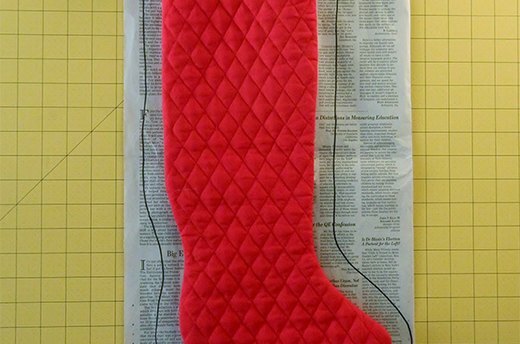 Pin and sew a 5/8-inch seam around the outside of the stocking, leaving the top open. Make sure all layers of the stocking are firmly secured in the seam. Trim seam to ¼-inch, clip curves, turn to outside, and iron. On the fold, cut two pieces of the contrasting fabric, 5/8-inch wider than the stocking at the top of the cuff, angling to 1.5 inches wider at the bottom of the cuff and about 4-inches long (depending on how wide you want the cuff to be.) With right sides together and starting at one short end, sew a 5/8-inch seam around two short and longest side, turning at corners and leaving top open. Clip corners and trim seam to 1/4-inch. Turn right-side out and iron cuff. Starting at the back seam of stocking, pin cuff to top of stocking on the inside, overlapping ends of cuff at back seam if needed. Sew cuff to stocking. Open cuff out and press seam towards stocking. Turn cuff over stocking and press flat. To make the hanging loop, cut a piece of contrasting fabric 5-inches long and 2-1/2-inches wide. Fold in half lengthwise and press, then fold each long side to the inside towards the fold and press again. Fold the pressed folded edges together and stitch along the length of the loop. Pin loop to inside of stocking at the back seam. 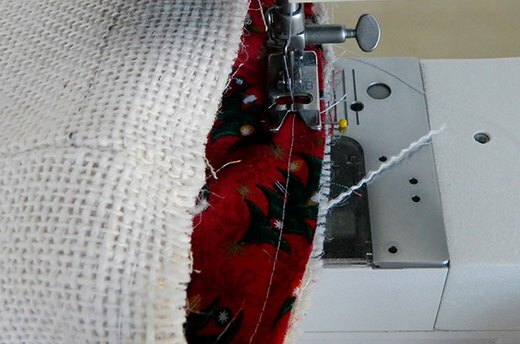 Stitch around top of stocking ¼-inch from edge of cuff, double-stitching the loop to secure it. You can also make the loop from a piece of ribbon in a contrasting color, stitching the ribbon around the cuff for decoration. Now it’s time for the fun. Using glue or thread, add ribbon, buttons and beads to your design to give it all the color, depth and texture it deserves.